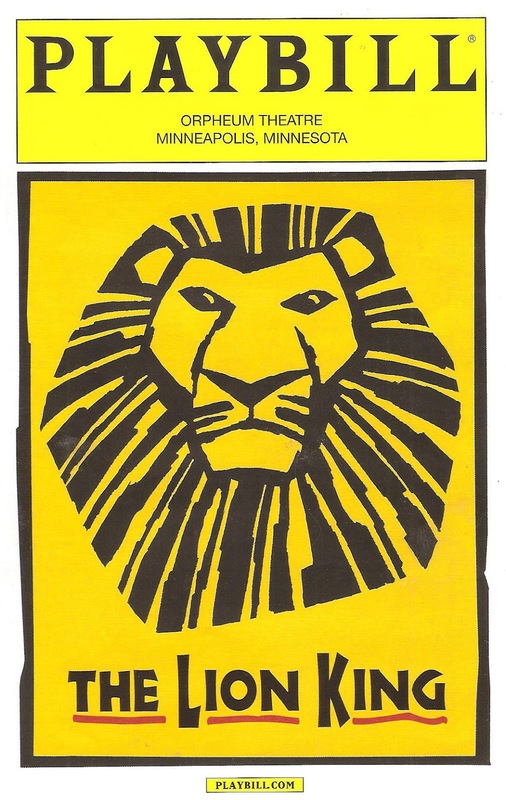 Nineteen years after its pre-Broadway premiere, the national tour of The Lion King returns to the Orpheum Theater in Minneapolis where it all began. 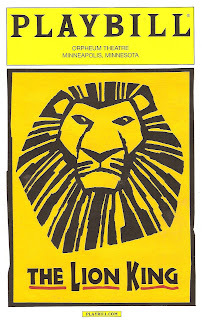 Since leaving the Orpheum after it's first run in 1997, The Lion King has gone on to win eight Tony Awards and become the third longest running musical on Broadway and the "top earning title in box office history for both stage productions and films." I saw it in the original run, and twice since, but seeing it again is every bit as thrilling as it was the first time. It's without a doubt the most successful Disney movie-to-stage musical adaptation on many levels - financially, creatively, musically. The creators of the stage musical took a two-dimensional children's cartoon movie and turned it into a wholly satisfying three-dimensional spectacle of music, dance, puppetry, and story. It's a big-budget spectacle that's also uniquely beautiful and moving storytelling. As Dana said in that one episode of Sports Night - look what we can do! In the Hamlet-esque plot, the young (lion) prince Simba is leading a happy and privileged life until his uncle kills the king, taking his place. Simba leaves his family and community in grief and despair, until a visit from his father's ghost convinces him to return, seek justice for his murdered father, and restore peace to the pridelands. Around this basic and familiar story is hung some truly thrilling production effects that only add to the storytelling. Every animal in the kingdom is represented by graceful puppets, designed by director Julie Taymor with Michael Curry, and manipulated by this incredibly talented cast. In the opening number, the animals are called to celebrate Simba's birth, and creatures of wing and hoof parade through the aisles of the theater, including a huge elephant with a person in each of four legs, joining the giraffes on stilts and other animals on stage. Birds fly overhead, cheetahs move with catlike grace, and hyenas scoot low to the ground. The set (designed by Richard Hudson) is relatively simple, allowing the animals to be the center of attention, yet it's also massive and beautiful as it effectively sets the scene from lush forest to barren graveyard. The costumes (also designed by Julie Taymor) cannot be separated from the puppet design, as all are one in creating these human/animal characters. In addition to being a feast for the eyes, The Lion King is also a feast for the ears. The score begins with Elton John and Tim Rice's fun poppy songs from the movie ("Circle of Life," "Can You Feel the Love Tonight") and adds authentic African sound (additional songs by Lebo M and others, with orchestrations by local composer Robert Elhai along with David Metzger). Multiple African languages are sung and spoken and African rhythms are beat on many drums in view of the audience, as the orchestra plays this full and lush score. And perhaps the largest cast I've ever seen in a musical gorgeously brings all of this ingenious creation to life in front of us with humor, grace, beauty, and power, perfectly blending the puppet with the person behind it, the animal and human elements of character. With all of the racial tension and prejudice in our world right now, it's a beautiful thing to watch a brilliantly talented and largely African American cast, and to celebrate African music, dance, culture, language, and traditional values of community and respect for those that came before. Which really are universal human values. The inspiring themes of community, justice, responsibility, and oneness with all living creatures and the earth herself are as much a part of the success of this piece as is the spectacular design. The Lion King continues for one more week at Minneapolis' Orpheum Theatre before it moves on to another corner of the world.